People like you have driven or biked around much of the South Bay collecting street-level photos and have uploaded it to Mapillary under an open license. We’ve identified areas that have lots of Mapillary imagery; use it to add points of interest like businesses, restaurants, and places of worship. The data we add together will make it easier for South Bay residents to find points of interest using OSM-powered maps and applications. This project was originally prepared for the National Day of Civic Hacking mapathon in San Jose on September 23, 2017. 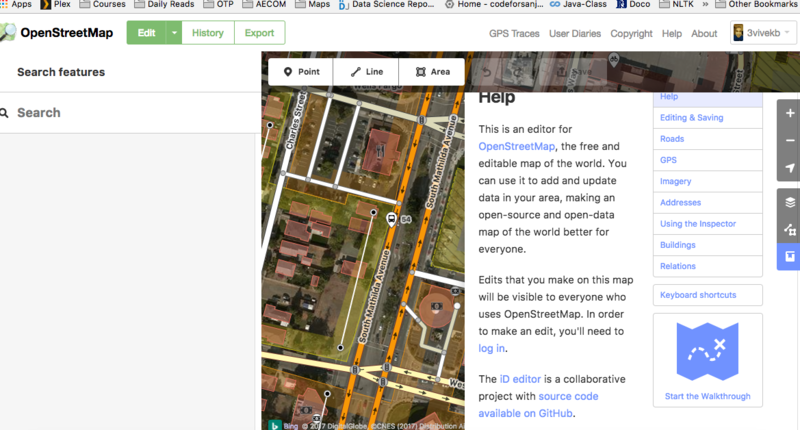 Head to openstreetmap.org and create an account. 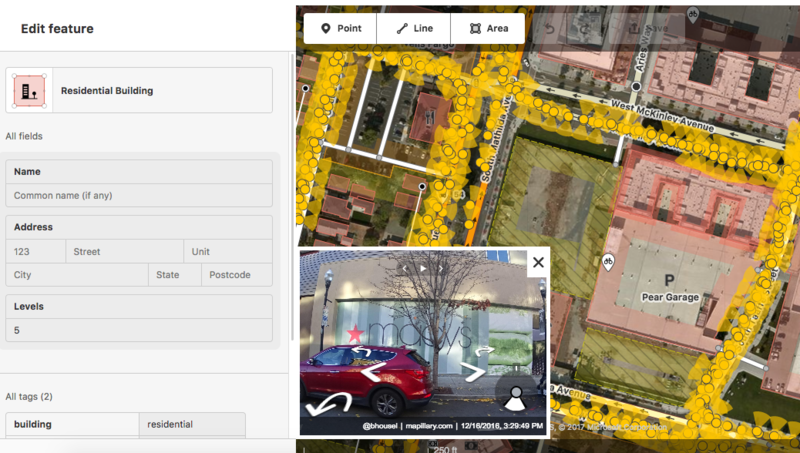 Open the Map Data panel and turn on the Mapillary photo overlay: Or head to Mapillary to browse available street level imagery. 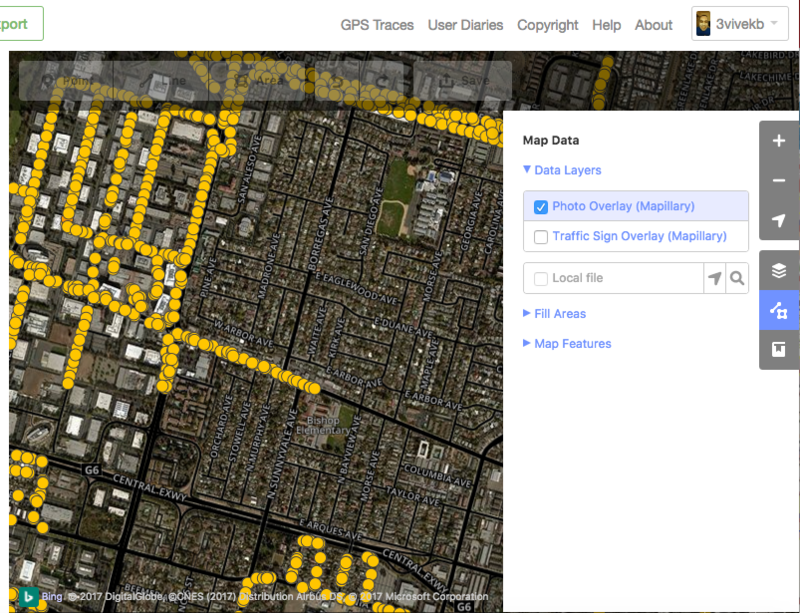 Click on the yellow icons to see street level photos. Find stores and businesses missing from the map and add them! You can zoom in on the photo using the scroll wheel, or click “mapillary.com” in the corner of the photo to open it in a new window. If the building containing the business isn’t on the map yet, draw it as an Area and tag it as a Building. If the business occupies the entire building, select the building, change Building to something more specific like Restaurant, and add details like the name, address, phone number, etc. Otherwise, if the business shares the building with other businesses, add a Point inside the building, tag the point as something specific like Restaurant, and add details like the name, floor number, website, etc. When you’re done mapping the businesses in your assigned area, click Save, review your changes, and click Upload. As soon as you finish drawing an Area or Point, the search bar lets you search for presets like “coffee”, “pharmacy”, or “lawyer”. You can also search for some common chains like “starbucks” and “valero”. Or for something really unusual, search taginfo for tags that others may’ve used for similar features. The wiki also has documentation on the proper format for addresses and phone numbers. The format for opening hours is a bit complex; this tool can generate it for you. If your browser is running slowly, try zooming further in so fewer features are visible. You can also open the Map Data panel, expand the Map Features section, and turn off feature types you aren’t interested in mapping.